Second day trying to get into WvWvW again, since release year, my first day was pretty good, and then today I kept getting kicked out of the squads today because i'm a thief/deadeye....Is this normal or is my server just being kitten? like it doesn't make any sense because the squad isn't even close to maxing out. They just don't want me in there for being a thief/deadeye. Is this how it is now? It's no fun playing alone, but at the same time, I don't want to make another character because my deadeye is my main. do they just kick you out or also tell you not to follow them? There are no rules on how anyone should or shouldn't, must or mustn't.. it is simply just the squad leaders silliness. I would hazard a guess that same squad leader was crying out for people to join squad when no one was bothered. Every class has the ability to be good or bad because much of it comes down to the person behind the pixels. OP if out it continues to happen, simply don't join the squad, do your own thing or just follow the zerg train, and when it wipes just go stealth, get out of the way of the train wreck and /laugh in chat... or swap servers and go pick them off for fun and karma. The „ silliness“ is called common sense. The Squad Leaders job is not only to command the fight but also to create a zerg that had the highest possible win chance. A Deadeye inside the squad is simply not worth much. Outside he is gold worth ( the good ones atleast). Not every class has the potential to be usefull in Zerging. At this point, even Weaver can be seen are borderline usefull. As it is just a second choice Scourge. People need to except that not every class is good at everything. Thief/Rangers make unbelievable good roamers. You can play outside of the squad. Shocking, I know. You have to bring something to the squad, to justify the boons/heals you will he getting from it. Scourge brings corrupts, eles aoe dmg, reves heavy ranged pressure plus boons, firebrands boons and heals. What does the deadeye bring? Single-target dmg? Not worth the spot in the squad IF THERE ARE BETTER CLASSES UNABLE TO JOIN SQUAD. Buy tag, tag up, accept in squad whoever you want to. Tell us how it went. I think you misunderstand, it's not about how good you are with any particular class, it's about what you bring to the group. Comped squads are all about each class in a particular group synergizing with each other, as far as sharing boons, healing each other, big aoe damage, clearing condis, etc. Generally if you are on a comped class it is very hard to survive on your own without help from the others in your group. They need to be in the group, and on top of the commander, because a lot of abilities only share with the others in that group. Thieves don't need help surviving, and can't stay on the tag during pushes against larger groups, thus those boons, heals, condi clears, etc are being "wasted." Now, I'm not saying thieves can't be put in their own sub-group in a squad, which is what most commanders do anyway, but I'm just pointing out the reason behind why a lot of commanders just don't take thieves into their groups. It's the same with rangers and engis (for the most part), so don't feel too bad. I main a deadeye.. have mained a thief in wvw since day 1.. It comes down to how you build it, how you play it. Sure we are excellent roamers, but a rabblefest requires very little skill other than stay tight, do your dmg, dodge the circles and pressure the blob to force them to unload cleanses, heals and dodges early before reeking havoc... Then again intelligent zergs don't just run in regardless, a good thief will loiter on the backline and pick targets, often key targets, then when the opportunity arises a quick shadow step dmg spike and maybe a clusterbomb or shadowflare/binding shadow then back out. Not every player or class rushes in clueless just cos its a zerg. I would hazard a guess most good roamers know how to play their class and be more than just a number in any zergwar. you are still not getting the point and by this time, I´d say deliberately. What OP described is probably not even a hostile action against him. Oh I got your point, I just disagree with it. We see all day tags shouting out for FB, necro's and whatever else they perceive meta to be, but when it comes down to a zergfest its just a numbers game. Organised squad fights will largely be guild runs, but large number squads is just that.. numbers. Sure the tag can do what they want, which is why I say don't run in squad stay out and run with it or yeah roam if you wish, but to say one class or another is of no use in wvw zergs is just rubbish. I still remember some of the tags on my server shouting out, open tag but only want hammer guards and ele's, without knowing why they wanted them, but other tags had shouted a need so it must be gospel and then cried when squad sizes were too small to even make a dent... fun times. By the way.. I never said I was a hostile act played on the OP, but then again a decent Comm seeking specific group organisation would likely not run with an open tag to avoid this very issue. If you run open and shout for joiners, your going to get whatever comes along seeking a Dorito to follow, good player or bad no matter what the class. The position that any player should be booted for not playing a standard prof/build is ridiculous. It's based on the presumption that every slot in the squad is precious and that both sides in any encounter will each have a full squad, so evenly balanced that even a slightly less effective single player will cause inevitable loss. Absurd. Doesn't happen. Normal implies universality, which is not accurate. Some, perhaps even 'many', commanders insist on Meta builds for squad/zergs, so they will reject/eject any thieves, along with Holos, non-Medi Scrappers, non SB Warriors, Renegades, Reapers, and any guardian not playing FIrebrand. Mesmers tend to get a pass because of portals, veil, gravity well/pulls, and because Mesmers get a free pass in GW2 all the time anyways ever (not bitter, I promise). BUT, there are commanders who run open squads and will accept any profession, the only requirement being to stay on tag. Maybe I'm just uber lucky on my server - I dunno - but I'd say about 30% of the commanders who run open squads on my server will take anyone. The other 70%? Yeah, they go for meta builds. But even out of the squad, you can play a vital role in fights, and you are ideally equipped to ambush and pick off enemy reinforcements as they run back to their tag during a fight. Any zerg DPS is likely full glass so they will be easy pickings for a DE. they might let you in if youre a daredevil staff teef. i play guard and stopped joining squads in wvw no need for that anyway to many wanna be commanders try to force ur build to what they "read" somewhere is right. You guys give me headaches with this continuous topic by diff. people every few weeks. Read up on previous forum post on this topic with the replies sigh...anyways gl in WvW and tip squirrel = find a havok grp/guild youll be loved alot more...i dont say no to deadeyes in my gangs havok raids. You don't need to be in squad, just float around and make the fight easier for your side, just read the room so you don't mess up a squads stealth or whatever. You'd just end up in a group with rangers and other thieves anyway and you'll probably eventually start playing in and out sort of tethering anyway and you still get enough friendly stuff on you. You don't bring anything useful to the squad. That's not the same as not being useful to the group, mind you. Squads are more for proper boon sharing and directing of AOE bomb damage. Thief does not contribute to either, and doesn't need either to work the same. What people fail to realize is that squad comps are mostly melee because boons have a short range. This is why deadeyes and rangers that pew pew don't need to be in a party; they aren't even going to benefit from it. But then again, if you're on comms and don't immediately die, chances are people will sometimes make allowances for you. Daredevil would have a higher chance though. You still don't need a squad slot, but you can certainly run with them. 1 player may not. Problem is it's never just 1 player. More like half the group is typically deadweight, and those might already be on meta classes. Which is why the baseline is "join x class". A really bad revenant will still do much better than a really bad ranger or base engi. It's also about rule consistency. If you allow any class to join your squad, then you will literally get people playing "any class". Basically, it's not that every dot is precious. It's more like one is hoping any of the dots is going to do anything besides die immediately. Have fun playing without an optimal comp vs EU servers like RoS, WSR or Kodash and you see how precious these spots can be - oh I forgot! WvW is about flipping little towers and running head-first agains keep gates / running from enemy zergs so you can PPT in peace - the real fun in WvW! You should try roaming. Deadeyes are one of the best roaming classes. Since they can stealth indefinitely at any time, it's almost impossible to actually lose a fight as a deadeye. If you can't win, just stealth away! But at the same time, pretty much nobody can escape from a fight with a deadeye unless they let you. That gives you a lot of control. On top of that, you can deal insane burst from stealth! It's a pretty complete package for roaming. Get to know some other roamers from your server and team up! The great thing about deadeye in a pairing is that you can remain in stealth so the enemy doesn't know you're there (or at least doesn't know where you are!). Then you fade in with a timely burst they weren't expecting while they're focused on your teammate! I had a deadeye team up with me yesterday and we were able to harass and eventually take down much larger groups, at one point winning a 2v6 by picking them off one by one while repeatedly engaging/disengaging. It's a very frustrating spec to deal with and you can use that to force mistakes, especially from overconfident enemies. But if you want to run with the zerg, just follow the squad and snipe. You don't actually need to be in the squad to do this. You don't need to be in squad on a deadeye, I mean if you are playing it properly then a lot of the time you shouldn't even be near your squad you should be out flanking / behind the opposing zerg, so it is rather pointless being in a squad given that. However that aside, a big part of the problem of classes not being wanted in squads is simply the balance is the most atrocious I have ever seen in a game. It is not uncommon for 80-90% of a 50 man squad to be made up of the same 3 elites (I don't even need to name them), 3 out of 18 elites, it is laughable and people wonder why WvW is dead. (and let's not even go into how dull the combat is with these three as the meta). However that aside the balance is the most atrocious I have ever seen in a game, it is not uncommon for 80-90% of a 50 man squad to be made up of the same 3 elites (I don't even need to name them), 3 out of 18 elites, it is laughable and people wonder why WvW is dead. (and let's not even go into how dull the combat is with these three as the meta). I brought this up in state of wvw thread and got replies explaining to me that fb/scourges are fine and nothing needs to be done with them as all classes are designed to skill spam just as fb/scourge is so their fine and in no way overshadowing most other classes. All of which can be done out of squad, with your own party of like classes being ideal. If you're in their backline you are are not near enough to the squad to be getting boons anyway so it's pointless for you. k u play a gank class and u dont want to play alone maybe its time to make a useful class for zerg fight? In the squad you can do your job of scouting, flanking, picking squishies, finishing downs, etc AND get participation. Many thieves don't know how to do this/many commanders don't know the value. Its a completely selfish class compared to other roaming builds such as Boonbeast, Chrono, Holosmith, all provide some sort of group benefit. Thief is a completely selfish class when it comes to group play. I say this as a thief main, but also as a tag. I'd much rather have a mesmer doing scouting than a thief. A chrono has 10x more group utility than a thief weather it be veil, portals, or AoE CCs and boonshare. Squad spots are reserved for the core zerg classes. You might get in on a DD vault thief, but mostly the squad is for the sustain/DPS ball. So FB's, Scourges, Heralds make up the core, an occasional SB, Scrapper or Tempest. The DE whilst doing great single target damage doesnt do AoE, say you down someone at 1500 rng in the enemy zerg, ok great. Now hes down in the middle of their zerg and will get auto revived. It's why AoE dmg is king, you need to be able to drop targets and then drop mass AoE cleave on top of them. You might even snag an additional couple of rezzers. DE's, one shot SB's, etc etc usually all lurk around the main zerg just waiting for sniping opportunities. Or roam, these squad classes, Scourges, FB's, Hammer Heralds etc, they do not roam well. Well not like a condi Mirage or DE can. You don't need to be in the squad, unless it's for participation. If it's a squad that is running an organized meta server comp, roaming classes like thieves are not needed. They can roam around the tag if they want, but you don't want a map full of them. We can almost have a map full of rangers on EBG, who never join an open squad. They don't complain, apart from when they get farmed by organized zerg, but maybe it's just the state of our Server and link right now. normal does not imply universality, it implies the illusion of it wich highly depends on point of view. for a human nearly everything can be normal depending on the point of view. however i said 'normal' more in the sense of it being rather common. OP, those making the squad are players just like you. Nobody can tell them how they should play. Just create a squad and try to make it work your way. Doesn't matter if ends in failure, you will learn, and that's a huge win. The question you should be asking yourself is, what do I bring of value to warrant being included in organised squad composition as a thief/DE regarding zerging? The answer is not much because other classes exist which do the job better. There will always be a meta and any decent commander will set up a squad with those base foundations in mind (Firebrand, Scourge, Rev, the rest are fillers e.g; mesmer veil, tempest, spellbreaker offensive/defensive winds, I still see Scrappers at times). It all depends on the individual commander... yes nasty ones exist. I assume you must have had a bad run-in with the latter. At the end of the day the best you can do is directly communicate with the comm and let them know what you bring to the table in terms of being a DE and hope they give you a chance. Prove that you can generate downs, finish them, don't get clapped in one hit, don't be a free bag for the enemy. Chorazin.4107 Makes very fair points. depends how your trying to play your opposite zerg.. most decent tags will want to splinter their oppositions zerg and pressure them to dump their support/utility skills.. once this is achieved then backline classes like thief will mop them up pretty fast. Like I've said it's about knowing how to play your class/build effectively in each situation. A zerg has both a frontline and a backline... whilst you may have preference on what you want, and that is any squad leaders prerogative it does not mean any specific class has no part to play or is of no use so must go roam. Wvw is already a struggle in terms of numbers and coverage, for many servers so for open tags to start discriminating against classes only serves to exacerbate the issue. Not everyone seeks to be a solo roamer, especially when there is already disparity in the matchup making roaming that much harder. With alliances incoming if that same discrimination is allowed to carry over it's likely only going to to hurt the mode more imo. Zergs having a frontline and backline isn’t true since god knows how long. 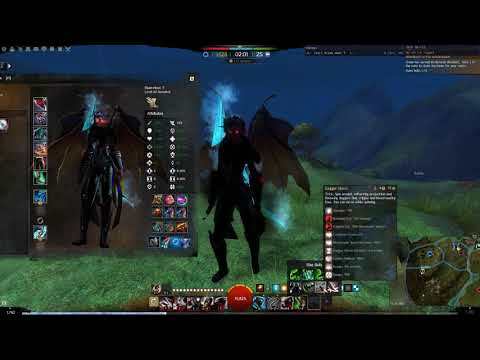 If you are a skilled roamer, then you should know how wvw and Squad setup works. And no. Its extremely rare for a thief to „ mop them up“. B.) The enemy must be kitten brain dead. Alliances wont discriminate people for their class choice but for skill and knowledge. If you are an amazing thief then surely Alliances will want you as roamer. But knowledge is to know that there are better choices for general zerging. Thief/Rangers QQing all day about not getting in a squad usually lack both. Wait, what I write now may break your heart, but.. that's how it works. Builds are optimized for group play. It's the same as in PvE raids. You try to maximize the support/damage/healing your class can bring. It's a numbers game and numbers the important factor here. It's not something "someone writes somewhere" but a mathematical calculation. Your build may be fine, but it's not best at what will be expected from you. In the end the rule is very easy: Only the commander decides who joins his squad. If you have problem with this just make your own squad and do your stuff. They're concerned that you'll steal their boons and run away. You're a thief after all. It's also the lieutenant who can decide who joins the squad. Sometimes I see a commander and lieutenant only running in squad and rest refusing to join. At the end of the day, all that matters is the player base supporting the commander. If you want to lead a pug group then it's important to be more patient and tolerant of diversity is classes and skill levels. Make the best of what you have rather than worry about numbers. Educate and encourage rather than force and upset the crowd. Sometimes I see a commander and lieutenant only running in squad and rest refusing to join. If you know that for a fact it means you are either the commander or the lieutenant so it seems like a non-issue. Seems like you don't know how to join and leave the squad. Top left corner mate. Look carefully. It's right there. And there was never any issues. Thanks for dropping by with such valuable analysis. Appreciate your time. the conversation kind of devolved here into squad and commander tag but to summarize - regardless of what personal opinions are, the tag has the right to accept/kick whomever they want. People may think it's stupid but it's true - they can control the group. As a ranger myself, I don't join squads and quite honestly don't miss it - why join? I listen in discord and keep up. Getting the boons/heals doesn't really apply because I'm not frontline pushing with the classes that can give boons or healing so it doesn't really add much. My feelings aren't hurt to not be in the squad (plus I can park and get a drink/food whenever I want) and not get told "stay on tag!" Funny part is, this is 100% true. Mostly the thief is inside or near the squad blob pre fight. He gets boons and then runs of doing whatever.